TechNet Plus is a paid subscription service from Microsoft that allows IT professional subscribers to access premium resources to evaluate Microsoft technologies, plan deployments and support user’s IT environment. 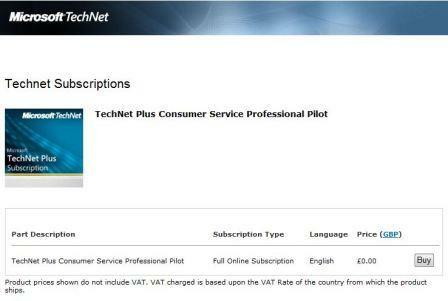 The main benefit of a TechNet Plus subscription is subscribers can download full-version software with no time limit or feature limit, including applying for free genuine and legit product keys. TechNet Plus subscription normally costs USD $349 for new subscription and $249 for renewal without discount or promotion deal. Microsoft apparently is going to launch a new web-based professional support service offering. In order to gather feedback for the new offering, Microsoft develops a exclusive pilot program named TechNet Plus Consumer Services Professional Pilot. As a token of appreciation, participants will receive free one-year subscription to the TechNet Plus Direct worth GBP £237 or USD $349. Also included is free Microsoft support call worth British Pound £171. Survey takers also can win one of eleven Zune 4, one of six xBox Arcades, or one of five Flip Video Mino HD Camcorders in regular raffles throughout the course of the pilot program. Only residents in US, UK or Canada with a valid address, postal code and telephone number is eligible. Once you complete the screening survey, instructions will be given on how to sign up for free TechNet Plus Direct full online subscription with 1 year validity via a registration URL. The registration URL in fact has been abused by many as the loophole for anybody and everybody to grab a valid 1-year subscription of TechNet Plus Direct (named as TechNet Plus Consumer Service Professional Pilot Full when sign up, but it’s still a full online subscription). Once there, click on “Buy” button (make sure it’s zero 0 cost), login or sign up Windows Live ID, and follow online instruction to order TechNet Plus Consumer Services Professional Pilot (Part # TRI1X000NTNONE). After ordering is done, a Subscriber Benefit Access Number (BAN) number will be given, which can be used to activate TechNet Plus subscription. Once you have completed the registration, you will be able to access your online benefits, including Subscriber Downloads from the TechNet Subscriptions Management page. The products that will be available for free including Windows Vista, Windows XP, Windows 7, Windows Server 2008, Windows Server 2008 R2, SQL Server 2008, Microsoft Office 2007, Microsoft Office 2010 and many more, probably except Visual Studio which more meaningful for developers at MSDN subscription. Those who order the free TechNet Plus subscription also manage to get Hyper-V Changes Server Virtualization Options whitepaper from Directions on Microsoft and Implementing Hyper-V in Windows Server 2008 e-learning course 6536 from Microsoft Learning. WARNING: Using the trick above to subscribe to TechNet Plus without participating in the research activities is in fact illegal, and the subscription may be revoked and made inactive anytime (proof from 1/1/1900 expiration date).